This book aims at an up-to-date and accessible development of algorithms for solving convex optimization problems. 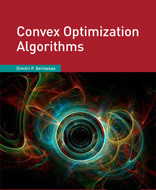 The book covers almost all the major classes of convex optimization algorithms. Principal among these are gradient, subgradient, polyhedral approximation, proximal, and interior point methods. Most of these methods rely on convexity (but not necessarily differentiability) in the cost and constraint functions, and are often connected in various ways to duality. The book contains numerous examples describing in detail applications to specially structured problems. The book complements our Convex Optimization Theory (Athena Scientific, 2009) book, but can be read independently. The latter book focuses on convexity theory and optimization duality, while the present book focuses on algorithmic issues. The two books share mathematical prerequisites, notation, and style, and together cover the entire finite-dimensional convex optimization field. Both books rely on rigorous mathematical analysis, but also aim at an intuitive exposition that makes use of visualization where possible. This is facilitated by the extensive use of analytical and algorithmic concepts of duality, which by nature lend themselves to geometrical interpretation. The book may be used as a text for a convex optimization course with a focus on algorithms; the author has taught several variants of such a course at MIT and elsewhere over the last fifteen years. It may also be used as a supplementary source for nonlinear programming classes, and as an algorithmic foundation for classes focused on convex optimization models. It is an excellent supplement to several of our books: Convex Optimization Theory (Athena Scientific, 2009), Nonlinear Programming (Athena Scientific, 2016), Network Optimization (Athena Scientific, 1998), and Introduction to Linear Optimization (Athena Scientific, 1997). Dimitri P. Bertsekas is McAfee Professor of Engineering at the Massachusetts Institute of Technology and a member of the prestigious United States National Academy of Engineering. He is the recipient of the 2001 A. R. Raggazini ACC education award, the 2009 INFORMS expository writing award, the 2014 Kachiyan Prize, the 2014 AACC Bellman Heritage Award, and the 2015 SIAM/MOS George B. Dantsig Prize. The material listed below can be freely downloaded, reproduced, and distributed. The following sets of slides reflect an increasing emphasis on algorithms over time. Convex Analysis and Optimization, 2014 Lecture Slides for MIT course 6.253, Spring 2014. Based on the book "Convex Optimization Theory," Athena Scientific, 2009, and the book "Convex Optimization Algorithms," Athena Scientific, 2014.